Why Is Sweden Giving the “Alternative Nobel Prize” to Syria’s ‘White Helmets’? Sweden did not succeed in getting Bob Dylan to come to Stockholm to receive the Nobel Prize for Literature. Nevertheless as a consolation the “White Helmets” did arrive to get the Right Livelihood Award. This article examines a likely geopolitical rationale that the Swedish elites had for selecting that organization. Also, facts suggest a congruence between the stances of those elites on Syria and the declared political aims of the organization White Helmets. The reviewing of the institutions involved in the award-decision and process can also result relevant in pondering the reason for the event. Finally, to inquire into the role of Carl Bildt, as member of the board of directors in the institution ultimately deciding, is interesting against the backdrop of his opposition regarding the participation of Julian Assange and Edward Snowden in previous international events organized by the same institutions –all of them under the umbrella of the Swedish Foreign Office. Sweden’s awarding a prize to this organization –called the “murky White Helmets’ by Professor Jan Oberg– it might reveal a semi-concealed intervention in support of Hillary Clinton’s doctrine in the dirty war against Syria. In concrete, another means used by Sweden’s elites in uttering their pro-view for the No-Fly Zone campaign in Syria, and gathering support for it. “Hillary Clinton, as secretary of state, put into place a series of actions to overthrow the secular governments in the Middle East and to replace them with radical Islamic regimes. Why she was doing this? I know she has great connections, financial and otherwise, with Saudi Arabia, with Qatar, with Kuwait, with tyrants of the Arab world”. To these ends in Syria, the Swedish establishment has comprehensively supported the establishment of a No-Fly zone –precisely as advocated by Hillary Clinton. Beside illustrating Hillary Clinton’s stance on the No-Fly Zone issue, the video below shows also the risk of an all-out war against Russia and Syria, and what such measure would signify for the US Armed Forces (and others supporting the No-Fly Zone, such as the Swedish establishment). Click on the image below to the see the video. It would be worth to mention in this context the participation of the “neutral and nonaligned” Swedish air Force in the No-Fly Zone operation masterminded by Hillary Clinton –ultimately responsible for the bullets fired at close range against the head of the secular leader of the Libyan government, Muammar Gaddafi, while he was held prisoner and immobilized. “We came, we saw, he died“, says Hillary Clinton on video, while she laughs. Also, it should be reminded that the decision regarding the military participation of Sweden in Libya was taken at the Parliament after a proposition presented by Carl Bildt; a proposal that found uncontested support in ALL political parties of the Swedish political establishment, including the Left Party (the former ‘euro-communists’). Only the Sweden Democrats opposed. For the Swedish rulers, as it was for Hillary Clinton, it is not about religion or ideology, or about an “idealistic” solidarity with refugees from the Syrian war (in fact most of those migrants are not ). It is only about money. While those Sunni governments financially backed Clinton and the Clinton Foundation (mentioned in the above-quoted testimony by Senator Richard Black), the role of Sweden was to contribute either with direct public funds or with donations by important Swedish companies, such as Lundin Oil or Ericsson. In retribution, they got the kind of favours from Clinton’s State Department, which permitted further expansion of Swedish business in the area, such as Ericsson. Meanwhile, the business of Sweden with Saudi Arabia, or Sweden’s arms export to the United Arab Emirates, continues unabated [See my recent articles in “The Indicter” and “Global Research”]. Another promoter for a No-Fly Zone in Syria is the organization “White Helmets”. Undoubtedly, there are in that organization, like in any of that kind, true volunteer-individuals trying to make a humanitarian contribution. However, as organization at large, “White Helmets” is in fact another operation set up and financed by the same forces pressing for an escalation in the military conflict in Syria. In other words, the same factions that financed armed and trained the ‘moderate’ rebels –as the New York Times and the Washington Post call them (also called by the non-partisan media “moderate” terrorists, or “moderate jihadists”). This organization has been boosted and financed by a number of State-donors, all of them implicated in the US-led (Clinton/Obama) political and/or military coalition aimed to depose the presidency of Assad in Syria. Most of these countries count with economic benefits in the planned oil-pipe construction designed to pass through Syria and that Assad opposed; the real cause of the war. For instance, Germany raised recently its financing to the “White Helmets” up to $7.85 million. Other examples of funding governments to this so-called “non-governmental organization”: The US government has contributed with $23 million; the UK government with $4.5 million. Furthermore, in the analysis “WHITE HELMETS: ‘Save Aleppo’ Protest Proves How Easy it is to Dress Up Actors as ‘War Victims’“, author Vanessa Beeley refers to most elementary techniques –and visually highly effective– used to stage “civilian attack-victims” by activists converted for the occasion into amateur actors. [One example below]. One conclusion emerging in this analysis, considering also White Helmets own statements done previously in its home page, is that a main aim of its propaganda endeavour is bringing public opinion’s support to the ‘necessity of establishing a No-Fly Zone in Syria’. This is the geopolitical item that coincides with the one of Sweden’s political establishment pursuing a confrontation of “West” against Russia. And it is in this context where the Swedish award to “White Helmets” should be understood. The claims for a No-Fly Zone in Syria have been passed through standard psy-ops by the pro-Clinton corporate-owned press. This has been directed not only at American audiences, but also echoed among EU countries viewed as potential proxies for the escalation of the Syria military conflict. Sweden is, historically considered, the primary government in Europe to react positively to such calls. As Sweden now is giving its prestigious award to the White Helmets, the Swedish media have relentlessly reported in the most positive terms the deeds of the organization. 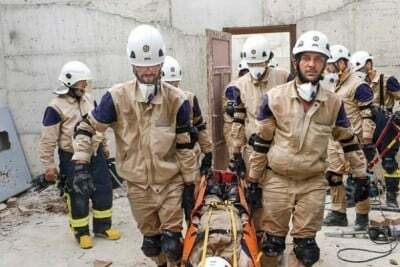 None of the international reports denouncing a variety of manipulation techniques in constant use by the White Helmets which have found space in the Swedish media. The image and video below shows how this is done. The appeals by “White Helmets” are done by fabricating or drastically exaggerating news on ‘war atrocities’. Hence, the suggestion of demolishing ‘air raids’ directed at civilian populations is a favourite number, for instance, in videos uploaded in YouTube. In the videos I have seen, however, such attacks never appear; what we see instead, solely, are rooms filled with smoke, dust, etc., where the same “patients” move constantly in the scene with or without anti-dust protection masks. Who is the Swedish institution granting the distinction to the White Helmets? Right now, as I am typing these lines, the Swedish Institute of International Affairs has removed its web page in English. There is a growing focus on that institution right now because of the Right Livelihood Prize to the White Helmets. So, one reason might be that they are ‘cleaning up’ the page. And they should. In the Swedish version of “Swedish Institute of International Affairs” that I have access to, I found that the largest single entity financing this ‘independent’ institution is ultimately the Swedish State. Secondly, I have found that the award-granting institution (Swedish Institute of International Affairs) is just a subsidiary section of the Utrikespolitiska Institutet. This in turn is an organization in which Carl Bildt sits on the board of directors. For new readers, Carl Bild is a former Swedish PM and FM who has been accused of being US agent. Apparently Carl Bildt still has some control over Swedish foreign policy. This stretches to such an extreme that when the State-owned TV organized a panel to discuss an emergent geopolitical situation, they invited Carl Bildt and not the current Foreign Minister Margot Wallström. One explanation was given by the then press spokesperson of the Swedish Ministry of Foreign Affairs, Teo Zetterman. “(Swedish) foreign policy is, historically considered, a political area characterized by consensus within domestic politics­ –more than in other spheres”, he said. This in its turn would help also to explain a) why the political stance taken by Sweden against WikiLeaks and its founder Julian Assange has been so consistently negative over the years. The case is a charade perpetuated with the aim of obstructing WikiLeaks in its publishing endeavours; b) how participating institutions in this manoeuvre are predominantly financed or administratively controlled by the Ministry of Foreign Affairs. C) Why in some of these activities we find the direct or indirect participation of Hillary Clinton’s US State Department. One example of the above was given on the occasion of the Stockholm Internet Forum conference of 2014 called to discuss issues of “personal integrity, transparency, spying and control”, and where Carl Bildt blatantly blocked the video-link participation of Julian Assange and Edward Snowden – which was suggested by the participants in the conference. What was less known is that even if The Stockholm Internet Forum is organized by The Swedish International Development Cooperation Agency (Sida), a main section of the Ministry of the Foreign Affairs, it is cloned with the International Visitor Leadership Program (IVLP) of the US Department of State. As the alliance with Hillary Clinton and her doctrine promoted by both Carl Bildt and Margot Wallström flourishes in the Swedish awards to murky organizations such the White Helmets, Swedish Doctors for Human Rights prepare a new presentation to the Nobel Peace Prize committee for awarding the prize to the organization WikiLeaks and its founder Julian Assange, for their contribution to transparency and democratic processes, cornerstones for world peace. Prof. Anders Romelsjö [Swedish]: Utrikesminister Wallström twittrar ”Honoured to meet Raed Saleh of The White Helmets” – al-Qaida’s friend. Also image 1 found in Prof. Romelsjö publication. Professor Dr med Marcello Ferrada de Noli is the founder and chairman of Swedish Professors and Doctors for Human Rights and editor-in-chief of The Indicter. Also publisher of The Professors’ Blog, and CEO of Libertarian Books – Sweden. Author of “Sweden VS. Assange – Human Rights Issues.” His op-ed articles have been published in Dagens Nyheter (DN), Svenska Dagbladet (Svd), Aftonbladet, Västerbotten Kuriren, Dagens Medicin, Läkartidningen and other Swedish media. He also has had exclusive interviews in DN, Expressen, SvD and Aftonbladet, and in Swedish TV channels (Svt 2, TV4, TV5) as well as international TV and media.